The Gaza strip has seen a number of Salafi jihadi groups emerge over the years. Some of them (e.g. the Majlis Shura al-Mujahideen fi Aknaf Bayt al-Maqdis, which was formed in 2012) now appear to be defunct, but others remain active, such as Jaysh al-Islam ('The Army of Islam'). The full name of this group is Jama'at Jaysh al-Islam fi Bayt al-Maqdis ('The Army of Islam Group in Jerusalem'). I was able to conduct an exclusive interview with Jaysh al-Islam, which I feature in this post. In centre: the emblem of Jaysh al-Islam. 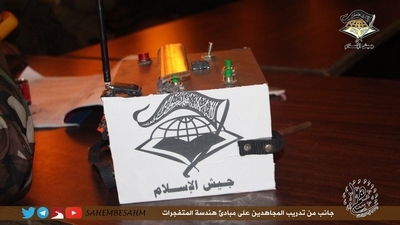 From a photo series: "From the training of the mujahideen on the principles of explosives engineering." A note on logistics: this interview was arranged via contact with the Qemam News Agency, an online news outlet that is the sole source for transmitting news and releases of Jaysh al-Islam. It took over a month to receive the answers to the questions I submitted. In the first instance, some consideration was given as to whether responses should be given. If a decision is made to give responses, the answers are written and then reviewed within the group before being sent back to the interviewer. Though the interview process might seem slow, there is understandable sensitivity about engaging with media and outsiders. After all, the Gaza strip is not a free-for-all environment where Salafi jihadis can do whatever they like, but rather they face the risk of arrest at the hands of the ruling Hamas movement, which is not Salafi jihadi and does not wish to pursue constant total war with Israel. Any parenthetical insertions in square brackets are my own. These insertions do not add to or subtract from the text, but only provide some contextual understanding for the reader. Q: When was Jaysh al-Islam formed and what are its main aims? Can we say that Jaysh al-Islam is a Salafi mujahid [waging jihad] group? A: Jaysh al-Islam is an Islamic group as opposed to the disbelievers from the Jews and Christians, Sunni as opposed to the Shi'a, Salafi as opposed to the people of innovations. It was announced in 2006 CE, deriving its manhaj from the Qur'anic text and the authentic Sunna of al-Adnani [Muhammad], prayers of our Lord be upon him, with the understanding of the predecessors of the Ummah. After that, you can call it whatever names you like for it does not harm us, as it suffices that God knows of us. As for our aim, it is in two forms: one is da'wi [proselytization], and that is the mission of the Prophets and the Messengers for the sake of which the heavenly books were revealed, whose foundation is Tawheed [monotheism] and doing away with shirk [idolatry] and kufr [disbelief], whether of Tawagheet [idolatrous tyrants] or false doctrines. The other form is jihadi that follows the da'wa and does not precede it, and is not separable from it. And the foundation of the religion is a Book [the Qur'an] guides and a sword gives victory, and your Lord has sufficed as guide and helper. Q: Does Jaysh al-Islam support the establishment of an Islamic Caliphate? And what is the correct path to establish an Islamic Caliphate? A: The best objective for which all Muslims strive is that the Shari'a of the Lord of the Worlds should rule them and their interests should be managed according to its Islamic system with which the Prophet Muhammad (SAWS) was sent. For the religion has been perfected: "Today I have fulfilled your religion for you." And the Shari'a has not neglected anything of the religion or this world: "We have not overlooked anything in the Book." So the da'wa of the Prophet to the Muslims and the command of the Lord of the Worlds to them is that they should be successors in this world. The Almighty has said: "Is not the one who responds to the one in need when he calls him and does away with evil and makes you successors of the earth? Is there a deity besides God? Little do you remember." All this calls for the Muslims to have an entity and this entity should have an amir who is the Caliph of the Muslims to bring the people out from worship of men to the worship of the Lord of men and the Jaysh al-Islam group is a part of the Muslims, striving for what all the Muslims strive and the path for that in all summary is a Book guides and a sword gives victory. Q: Are most of the Salafi jihadis in Gaza with the Dawla group [Islamic State] or the al-Qa'ida organization? A: First off, every person is responsible for his directives, leanings and orientations. As for if the question is about the Jaysh al-Islam group, we say seeking help in God: the Jaysh al-Islam group deals with the Muslims as part of the whole, for Ibn Majah narrated (and al-Albani deemed it authentic) on the authority of Anas (may God be pleased with him): that the Messenger of God (SAWS) said: "The Banu Israel [Israelites] separated into 71 sects and my Ummah will separate into 72 sects, all of them in the fire except one and it is the group." And we thus do not go out from the Muslim group in supporting or protecting or waging jihad in the face of the enemies of the Ummah from the Jews, Christians and Rafidites [Shi'a] and whoso has allied with them in Chechnya, Afghanistan, Iraq, Somalia, the Philippines, Nigeria, Libya and Palestine. Therefore the principle is that our relations and alliances arise on the basis of mutual advice and support in God's religion. Q: How are your relations with the Hamas government that rules Gaza? Do you consider the Hamas group to be a Muslim or apostate group? Has Hamas arrested members of Jaysh al-Islam or tried to stop the firing of missiles at the Jewish enemy? A: The Jaysh al-Islam group believes that all who rule by man-made laws are apostate disbelievers. As for the Hamas government's arrest of members of Jaysh al-Islam, the Hamas government has arrested a number of members of Jaysh al-Islam and that deed has been repeated. Q: Do you have a relation with any jihadi groups in the Sinai area? What is your position on the so-called Wilayat Sinai [Sinai province] affiliated with the Dawla group? A: We have been concise on this issue that our relation with the Muslims is the relation of the part with the whole, so our relation with any entity, group or even members arises on this basis. We support them in truth in what we can, and we advise them in what we consider to be from truth. Q: Recently you released a video in which you call on the people to undertake lone wolf operations against the Jewish enemy. How can supporters of the jihad undertake that? A: Rousing the Muslims to jihad and fighting the enemies of God is a Shari'i obligation we must undertake. For our jihad against the enemies of God is not limited to the spearhead but also includes the tongue. The Messenger of God (SAWS) said: "Wage jihad against the idolaters with your lives, wealth and tongues." And from that has come 'Wa Harridh al-Mu'mineen 'Ala al-Qital' ['And Rouse the Believers to Fight'- the video release of Jaysh al-Islam]: all according to what one can through prior preparation and excellent planning and exact implementation to inflict massacres on the enemies of God, whether through running over, stabbing or through rifles and machine guns, for killing Jews is affinity to God (Almighty and Exalted is He). For God's promise has come near and the entity of Jews will disappear and may the servants of God destroy what Jews have built and constructed. And we will hand over the banner to Jesus the son of Mary (upon him and upon our Prophet be the best prayers and peace), so 'Wa Harridh al-Mu'mineen' was a rousing call for the masses and to strengthen the aspirations of the soldiers and the cells, so the people will see the wonders of our activity by God's permission. Q: How many martyrs do you have in the path of jihad? A: What the Muslims have offered in the path of God cannot be counted and contained in a book and as we have made clear the Jaysh al-Islam group is a part of this Ummah. 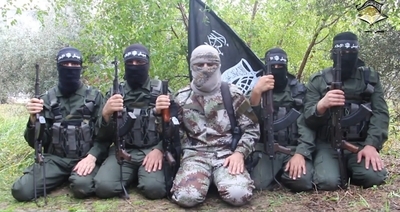 As for whoso has been killed under the banner of the army [Jaysh al-Islam], there are a number of those who have died in the path of God under the banner of the Jaysh al-Islam, we reckon them and God is their reckoner, among them: Muhammad Farwana (may God accept him), who was killed in the al-Wahm al-Mutabaddad operation [2006 Gaza cross-border raid] in which the Jewish soldier Gilad Schalit was taken prisoner, and among them [the martyrs] Mu'tazz Daghmash and his companions (Muhammad Asila, Nidhal al-Sadudi, Izz al-Azazi, Salah Qaduha)- may God accept them- who were targeted by the Jewish enemy during their movement to undertake jihadi missions. And before them: Fawzi al-Ashram Abu Muhammad, Shadi Abu Sariya (Abu Malek), Hussein Ahl, Aymenn Dalul, Osama al-Rifi, Sami al-Za'im and the martyrs of the al-Sabra massacre [massacre in a Gaza neighbourhood in 2008 committed by Hamas]: Ibrahim Daghmash the brother of Sheikh Abu Muhammad al-Ansari (may God protect him) and Alsa'ib Daghmash the military official for the Jaysh al-Islam group in Gaza, and others besides them. May God accept them all. Q: What is your position on the Islamic Jihad Movement in Palestine [aka Palestinian Islamic Jihad]? A: The Jaysh al-Islam group's position on the Islamic Jihad Movement is that it is an innovating group [i.e. commits innovations contrary to Islam] bearing a manhaj [methodology/ideology etc.] that is not correct or sound. Q: Have any mujahideen from your faction migrated to Syria in support of the people of al-Sham [Syria]? A: Supporting the Muslims in every place is an obligation on all the Muslims in what they can from their lives, wealth and tongues, just as SAWS said. And the Jaysh al-Islam group as a part of the Ummah of Islam undertakes this obligation in supporting the Muslims. For a group of the soldiers of Jaysh al-Islam have fought and been killed in al-Sham and elsewhere, among them Abu Huraira Nidhal al-Ashi (may God accept him), Sa'id al-Sandi, Sa'ad Sha'alan, Saleh al-Urqan. For these people are of those who died in fighting in al-Sham. And also Abu Jamal Mahmoud Abu Dalal, Abd al-Rahman Abu Maghseeb, and Mahmoud Zaghra and others besides them of those who died on the other fronts. May God accept them all. Q: How can the Muslims in the Ummah support your jihad? A: Jihad in our current time is a fard ayn [individual obligation] on the Ummah of Islam, all according to one's ability. So whoso can do so, that person wages jihad with his life. And the one who cannot wages jihad with his wealth in equipping the mujahideen and looking after their family as the Messenger of God (SAWS) said, or with his tongue. And from the jihad by the tongue is publishing all issued by the official media for the Jaysh al-Islam group. And from jihad by wealth is spending in the path of God and for that purpose the Jaysh al-Islam has launched the Sahim bi-Sahm Fi Sabil Allah campaign to equip the mujahideen and that is in order the door to be opened for the Muslims who cannot wage jihad with their lives so that they can wage jihad with their wealth. So all who want to wage jihad with their wealth can contact the brothers who run the campaign in order to receive their wealth. Indeed the jihad is in need of wealth, for wealth is the nerve of jihad, as has been said.